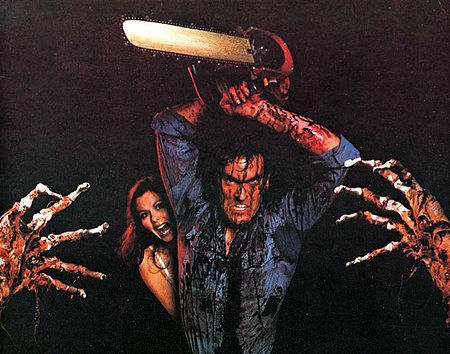 Yes, I know, we ALL want another Evil Dead movie. But if any of you are holding your breath, I suggest it might be time to exhale because this bad boy isn't going to happen until Bruce Campbell is old enough to look like William Shatner in Star Trek: Generations. There has been a low-level buzz percolating on this possible project for a couple of years now, but in the end it's all just talk. Talk of making another Evil Dead movie goes back (as far as recent history) to late 2004, when Sam Raimi apparently wanted to turn his attention to a sequel to Army of Darkness once he was done with Spider-Man 3. About a month later came word that the next Evil Dead movie would not be a sequel but a remake of the original film. This was not as bad news as you might think, as all the original folks involved in the movie were behind the idea and would be involved. Then about six months later (June 2006) came word that Raimi would not be involved in any new version of the film because he was swamped with Spider-Man work. The possibility of a new movie wasn't ruled out, just the fact that he would not be working on it. After that, the interwebs went quiet, and it seemed like the project was indeed, dead. Ah, but more hope (teasing?) made an appearance at this year's San Diego Comic-Con, where Raimi was promoting the back-to-his-roots horror film Drag Me to Hell. 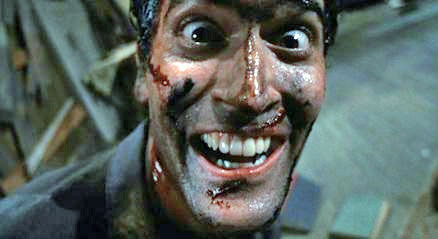 He mentioned once again that he was still "very interested" in doing another Evil Dead movie. Having seen some footage from Drag Me to Hell, it actually seems like it is the follow up film in the series. For fans of the "Dead" movies, "Hell" had the same vibe: a mixture of comedy, horror and over the top yet cheesy visual effects. A month later Bruce Campbell stoked the fires in an interview with MTV where he stated in reference to a new movie: "When he's ready [Sam Raimi], I'm ready,". Then a few days ago MTV deflated everyone's hopes in an interview with Sam Raimi stating that between finishing up Drag Me to Hell and with the impending back to back Spider-Man 4 & 5 that it is totally on the back burner. Finally, today comes word from Bruce Campbell via an interview with Horror-Movies.ca that "nothing is happening with the project." For the complete history on the possibility of this happening check out our Evil Dead 4 archive. Oh, and Drag Me to Hell opens on May 29, 2009.